ISBN: 9781782978244 | Published by: Oxbow Books | Year of Publication: 2015 | Language: English	184p, H297 x W210 (mm) b/w and colour illus. 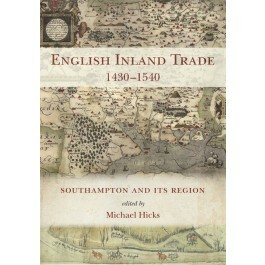 The Southampton brokage books are the best source for English inland trade before modern times . Internal trade always matched overseas trade. Between 1430 and 1540 the brokage series records all departures through Southampton’s Bargate, the owner, carter, commodity, quantity, destination and date, and many deliveries too. Twelve such years make up the database that illuminates Southampton’s trade with its extensive region at the time when the city was at its most important as the principal point of access to England for the exotic spices and dyestuffs imported by the Genoese. If Southampton’s international traffic was particularly important, the town’s commerce was representative also of the commonplace trade that occurred throughout England. Seventeen papers investigate Southampton’s interaction with Salisbury, London, Winchester, and many other places, long-term trends and short-term fluctuations. The rise and decline of the Italian trade, the dominance of Salisbury and emergence of Jack of Newbury, the recycling of wealth and metals from the dissolved monasteries all feature here. Underpinning the book are 32 computer-generated maps and numerous tables, charts, and graphs, with guidance provided as to how best to exploit and extend this remarkable resource. An accompanying web-mounted database (http://www.overlandtrade.org) enables the changing commerce to be mapped and visualised through maps and trade to be tracked week by week and over a century. Together the book and database provide a unique resource for Southampton, its trading partners, traders and carters, freight traffic and the genealogies of the middling sort. "The excellent cartography displayed shows what can be done and drawn out evidence-wise using this combination of methods…As well as shedding much new light on the English medieval economy, this well-produced volume illustrates how much modern digital techniques can extract from a source previously considered intractable."